Security checks. Long slow moving queues. Airport officials with no sense of humour. Snacksploitation. Ugly luggage charges. Then add into the mix cabin baggage. This allowance can be a headache because it varies so much. Little wonder that a Skyscanner survey indicated that 82% of UK air passengers want all airlines to comply with identical cabin bag allowance, and we suspect that other nationalities share this desire too. Depending on the airline you fly with, a packed bag should weight 6kg, 8kg, 10kg, 23kg or it can be an unlimited weight, provided you can lift it into the overhead compartment. You have a choice of two options when selecting airline carry-on approved luggage. You can opt for a standard bag manufacturer or check out what your favourite dive brand has on offer. At DEMA.2015 Apeks Aqua Lung unveiled their blue / black themed 'Explorer' collection. 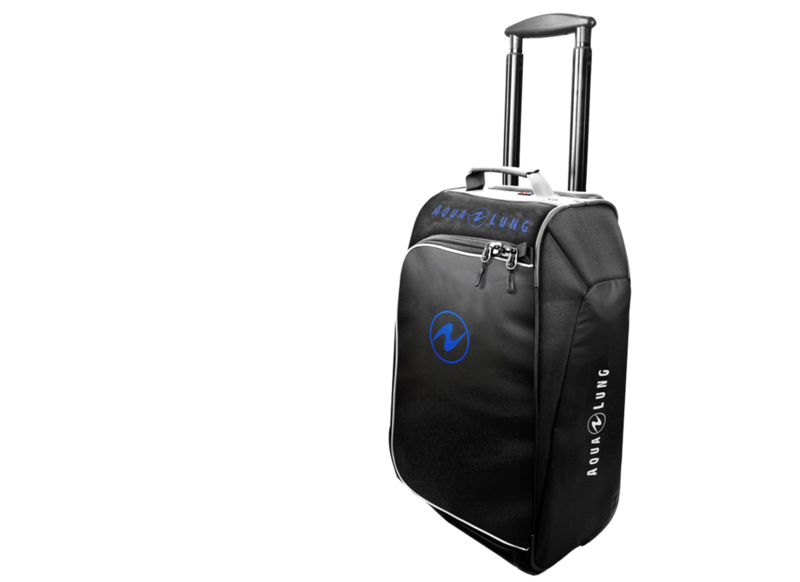 This luggage range comprises 7 bags; regulator case, mesh duffel bag, fabric duffel bag, mesh roller bag, fabric roller bag, backpack and a carry-on. Apeks Aqua Lung's Explorer soft-sided carry-on is made from a lightweight yet tough 1680 denier polyester. It has been designed to withstand the rigours of general travel and diving excursions - the corners are protected, the seams are reinforced and the side panels and a U-shaped zippable flap are manufactured from vinyl. This 56cm by 35cm carry-on has one compartment that provides a large packing space, accommodating 45.5 litres of luggage. The interior is lined in a 'silk-to-the-touch' material, with a full-length mesh pocket and zip fastening built onto the underside of the flap. For the uninitiated, aka non-divers, this case does not scream “I am fully of shiny dive gear worth stealing”. Instead this 3kg bag has a blue Aqua Lung logo tastefully embroidered on the front, with the bag flap and articulated sides appropriately logo'd. The back has a useful name plate on it. Easy mobility is achieved by two rugged wheels and an ergonomic retractable push-button handle. When 'pushed home' / secured, the curved aluminium handle is recessed, providing some measure of protection from baggage handling equipment and personnel. Turning the bag upside down, it is good to see the bottom has been protected with a durable plastic. A permanent stand is also attached to the bottom of the bag. This has two purposes. It stops the bag from falling over. Secondly it provides you with a grab handle, so that you can easily carry this bag two handed. The other hand uses the top carry handle that has been padded for comfort.